Are shower wall panels cheaper than tile? 7 factors you need to consider. Question: Are shower wall panels cheaper than tile? You’re probably saying that answer is a cop-out….and you’re partially right. As the owner of a company who installs tile showers locally and wholesales 4 different types of grout free shower panels on a nationwide basis I know the answer to this question is not a one size fits all proposition. So let’s check out 7 factors to help you get your arms around this question for your shower. Factor 1 to determine if shower wall panels are cheaper than tile. Do you have a standard sized shower? 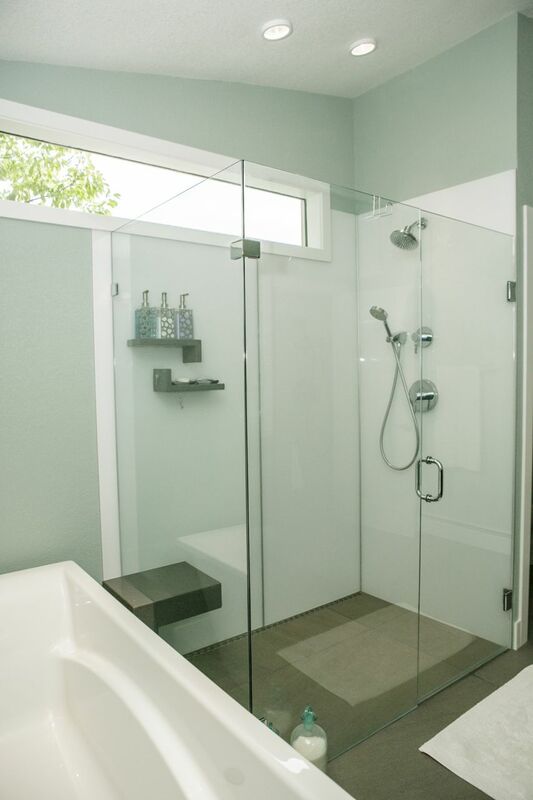 If you have a 60 x 32, 48 x 36 or 36 x 36 shower and you want the absolute cheapest (in the short run) way to cover your shower walls a fiberglass shower walls (or acrylic shower walls which are a tad bit more) is the best choice vs. tile. When you’re on a tight budget or are remodeling a low value rental property or motel the standard fiberglass systems available at your local home center store will have the lowest initial purchase price. The challenge is – they are not very attractive and generally don’t hold up well – but they are cheap. Factor 2 to determine if shower wall panels are cheaper than tile. Are you comparing material costs ….or are you comparing (material + labor) costs? If you’re looking to build a luxury shower and your labor is “free” (because you’re going to do it yourself) you will find the material cost of tile to be less expensive than the cost of materials for higher end grout free shower wall panels made of stone solid surface, PVC backed composite, optical grade acrylic or the Euro-inspired ‘No Tile, Tile Shower‘ panels. In this case tile will be cheaper…..especially in the short run (remember there will be maintenance costs to deal with – as you’ll see in Factor 3). If you are paying a contractor to install – the grout free panels will be comparable in cost to tile. Factor 3 to determine if shower wall panels are cheaper than tile. Do you love to clean and maintain your shower? 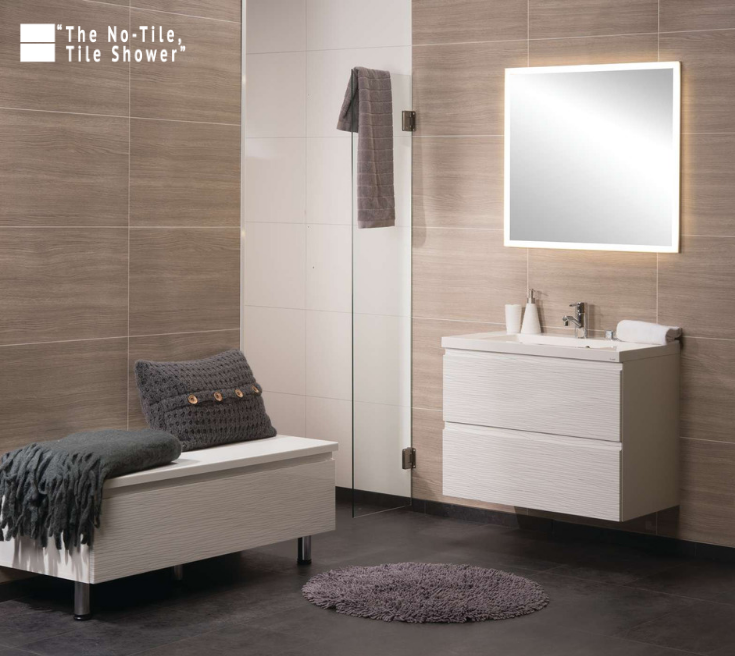 Let’s face it – tile is a pain to maintain. Cleaning, sealing and re-grouting are not anybody’s idea of a good time and there can be significant costs (including the cost of your time and/or hiring a contractor to clean or regrout) associated with maintaining a tile shower. While there are some types of tile grout which minimize these challenges (like epoxy or urethane grout) most people would still say “I love the tile, but I hate the grout.” If you like the look of tile or stone without grout joints a tile pattern solid surface wall system or standard acrylic wall panels can give you the best of both worlds. Factor 4 to determine if shower wall panels are cheaper than tile. Would you like a fancy or a plain tile pattern? If you like a fancy tile layout like a herringbone pattern with a unique glass tile border (a more intricate tile project) vs. a simple running bond (like the look of bricks on a wall) or stack bond (one tile on top of another) layout your labor costs and project complexity will be significantly different. When tile installation becomes more difficult the affordability of a luxury panel system (like cultured stone or laminate shower panels) becomes comparatively more affordable. 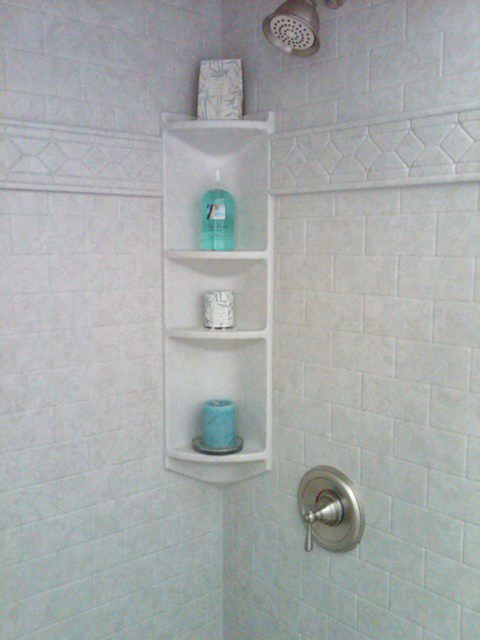 When the tile pattern and installation is more straightforward a tile shower may be cheaper than the wall panels. Factor 5 to determine if shower wall panels are cheaper than tile. Does black mold freak you out? If you have a family member with respiratory challenges and/or your just want to have the healthiest home eliminating the worry about mold build up can be a huge relief. 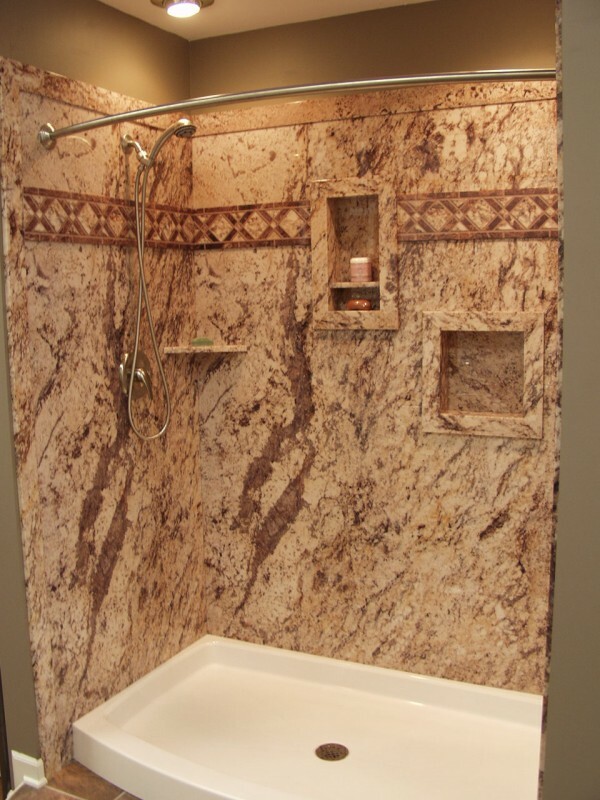 In this instance a grout free shower panel – of any type – can beat a tile shower hands down. In addition you’ll be assured on not having future costs associated with black mold removal. Factor 6 to determine if shower wall panels are cheaper than tile. How high are labor costs and how difficult is it to find contractors in your area? When the economy heats up you may feel you have to beg a contractor just to show up (and when they do “get around” to giving you a price they may price it so high it blows up your budget). In these instances it can be advantageous to go “out on a DIY limb” and do the project yourself. 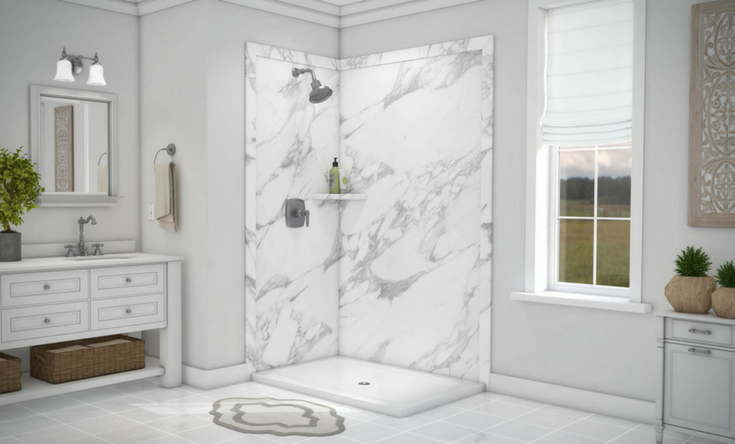 Fortunately even if you have a custom sized shower there are easy to install wall panels (the ones we have found to be the simplest to work with are the PVC backed composite faux stone walls and the stone solid surface panels) which require the least equipment and expertise to install. 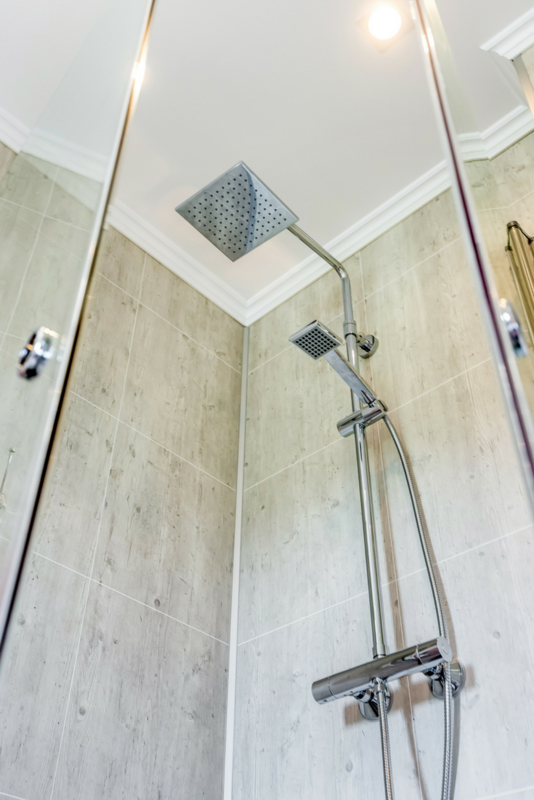 If you have a standard sized shower – even better – since there are cost-effective DIY shower kits which can also include a low maintenance shower pan. Factor 7 to determine if shower wall panels are cheaper than tile. Do you want a cool look but have a modest budget? OK- you love the look of natural stone walls or the luxury appearance of modern high-gloss look wall. In both of these situations tile just doesn’t look like the stone walls or have the glossy appearance like a glass wall. These are an instances where grout free wall panels can be a more cost effective answer than the real thing. For a stone look (at a modest price) you’ll want to check out a line of PVC backed composite walls which incorporate digital images of 21 different stone patterns (and are easier to install and maintain than natural stone). For the high gloss look optical grade acrylic wall panels can have the appearance of back painted glass at a better price (and they are easier to install than back painted glass panels). I wish I could have made a simple answer to the question – are shower wall panels are cheaper than tile…but it truly does depend. Make sure to consider the look you want, your budget, regional availability of contractors and your desire/ability to DIY the job to make your best decision. If you need help thinking through these options comment or call us at the numbers below. 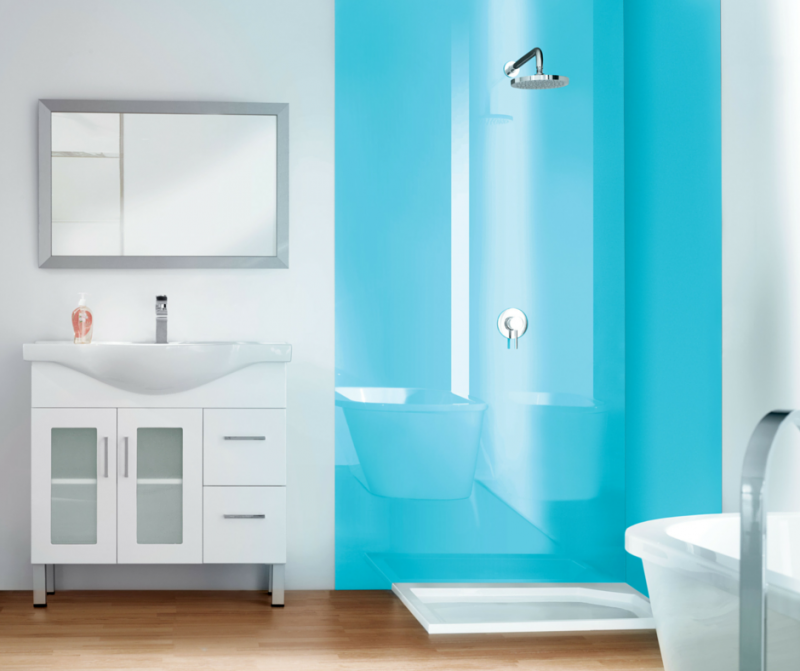 For a local bathroom remodeling project call The Bath Doctor in Cleveland (216-531-6085) or Columbus (614-252-7294), Cleveland Design & Remodeling (216-658-1280) or for nationwide supply or grout free shower wall panels Innovate Building Solutions (877-668-5888). If you’re in the building business, click here if you’d like to learn how to become a shower wall panel dealer or call and ask for Mike at 877-668-5888. What panels do you recommend for a standard sized tub? I install showers and tubs in the houston area and interested in obtaining more detailed informations that you represent so I can show then to my clients. I’m hoping you can help me on a dilemma. I color my hair in my bathroom. I am looking for something to panel my bathroom walls that will not stain. Mel – these products are manufactured in Australia and imported to the United State. They are durable and work well in showers, bathrooms, kitchens – or any place in a residential or commercial setting where you want a dramatic wall covering which is simple to clean (you can just use soap and water to clean them – nothing abrasive. Who makes and carries the optical grade high gloss acrylic wall panel shown or similar, and how durable and hard or easy to care for are they? Thanks! Can I use the PVC Backed Composit Faux Stone walls in a mobile home, on top of Sheetrock or does the Sheetrock need to be removed and replaced with a type of backer board? Beryl – thanks for your question. Yes – you can put these acrylic panels over old tile – the one key though is to make sure the tile walls are in good shape (that they are not spongy or have a bad backer system behind them). Hope this helps! to remove all existing tiles before installing panels?